We're Kickin Up our Heels and Spicin' Things Up! Weather you like a lot of spice or just a hint. just a something here for everyone. We've teamed up two distinctive flavors, wild Huckleberries & Jalapeno Peppers! WOW! Enjoy our Wild Huckleberry Hot Pepper Jelly as an appetizer with cream cheese and crackers or spice up your next pork tenderloin. Just simmer and drizzle over your favorite meat as a glaze or sauce. Not too mild, not to spicy. just right! ENJOY! 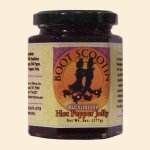 Ingredients: Sugar, Wild Huckleberry Juice, Vinegar, Bell Peppers, Jalapeno Peppers, and Pectin.